Ex-President Jimmy Carter has hogged the media spotlight this week over his intended - and subsequent - meetings with Hamas head honcho Khaled Meshaal and other Hamas leaders - thereby incurring the wrath of Israel, the United States, the European Union and the Palestinian Authority. Meeting with terrorists whose charter demands the elimination of Israel and the Jewish people is a total waste of time and undermines genuine efforts to end the long running conflict between Jews and Arabs. It appears Mr Carter has yet to discover this truth as the visit to the grave of his “dear friend” the late Yasser Arafat this past week has demonstrated. Arafat refused to accept the offer made by Israel in 2000 to create a second sovereign Arab state in former Palestine (in addition to the already existing state of Jordan). Arafat was unable to abandon his own charter calling for Israel’s destruction and found the choice of peace with Israel too difficult to make when it was presented to him on a plate. President Bush’s Road Map attempted to revive the idea of such a State in 2002 and was supported diplomatically by Russia, the United Nations and the European Union. Yet it has failed to make even the slightest dent on the diplomatic horizon to this very day and is doomed to failure. These lost opportunities will not come back again as the current situation in the West Bank and Gaza continues to rapidly descend into ever increasing violence. What therefore motivated Mr Carter to arrange his meeting with Mr Meshaal at this point of time and what he hoped to achieve by doing so remains a real mystery. One thing is certain - Mr Carter’s meeting will prove to be a definite non-starter in progressing the diplomatic comings and goings that pass for well intended - but totally misguided - attempts to end the Israeli-Arab conflict. Yet Mr Carter himself had hit on a definite starter to solve the Israel-Arab conflict more than 25 years ago. If pursued by him now, it could prove of immeasurable assistance in ending the 125 years old struggle between Jews and Arabs over the territory once called Palestine. 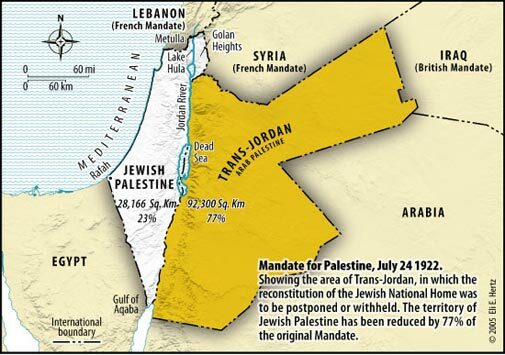 “He (Mr Reagan) pointed out that the land of the former Palestine Mandate originally included both sides of the Jordan River before Transjordan was established in 1922 in 80% of historic Palestine. The remaining 20%, he said, is today in Israel’s control.”. Mr Carter was correct in his assessment of Jordan - as was Mr Reagan and Crown Prince Hassan. Jordan is indeed a contrivance - the artificial creation of Britain, which in 1922 laid the groundwork that was to result in Jordan becoming a sovereign independent Arab state in 80% of Palestine in 1946. No Jews would be permitted to settle there - and are still so excluded - although it had been originally designated in 1920 as part of the area within which the Jewish National Home was to be reconstituted. Jordan’s crucial role is bringing to a successful resolution the claims by Jews and Arabs to sovereignty over the West Bank and Gaza - a mere 6% of the area of the former Palestine Mandate - is as relevant today as it was in 1982 when Mr Carter made his defining statement. Jordan indeed was in the diplomatic spotlight until 1988 when Yasser Arafat then declared the independence of a non-existent entity called “Palestine” and Jordan ceded all claims to the West Bank in favour of Arafat’s Palestine Liberation Organization sworn - like Hamas - to the total destruction of Israel. Israel also believed it could negotiate with Arafat and his terrorist organisation and signed the Oslo Accords in 1993 - a decision that failed to bring the peace that was so triumphantly postulated at the time. Mr Carter hopped on the Arafat bandwagon and thereafter totally ignored the role Jordan had to play in any negotiated settlement. He has done the cause of peace no service in adopting this illusory approach. Peacemaking attempts with those sworn to Israel’s elimination have thus proved an abysmal failure. Mr Carter now needs to go back to his original thinking and use his prestige and influence in encouraging Jordan to join in talks with Israel on the division of the West Bank between them. This has been and remains the only possible way forward to end the fighting between Arabs and Jews. Jordan already has a signed peace treaty with Israel - a treaty that has withstood many pressures that could have led to its termination since it was executed in 1994. It is a tribute to Israel and Jordan’s successive governments that they have maintained - and in many areas strengthened - their areas of co-operation and understanding whilst all other proposed arrangements with the Palestinian Authority have collapsed into a diplomatic shambles around them. Talking realistically to Jordan’s leaders and encouraging and supporting Jordan’s pivotal role in ending the conflict can certainly bear dividends of real benefit for both Jews and Arabs. Jimmy Carter raised expectations that he would pursue this charter in 1982. His abandonment of it since 1988 has proved to be a poor error of judgement. Running with the bulls has many dangers - one of which is they can suddenly turn around and bite you where it really hurts. Terrorist leaders like Khaled Meshaal are no different as Mr Carter will find out. Now is the time for Mr Carter to get smart, realise his error, revisit his 1982 thinking and pursue it to its inevitable conclusion.